When I heard that MyHabit was headed to Milwaukee & they wanted me to stop by their Brewers game tailgate I was SO excited. So often the Midwest gets overlooked as a fashion destination, so it's awesome to see a trendy company like MyHabit come to town. MyHabit was in Milwaukee last week during their #ShopByCity tour to meet their customers, host a tailgate (when in Wisconsin, right?!) & give away some chic totes & coupons. After the tailgate, we headed in to Miller stadium to watch the Brewers play. It was such a perfect Wisconsin evening (see my snapshot below). I even did an Instagram takeover for MyHabit sharing my mini travel guide to the city (check it out here). 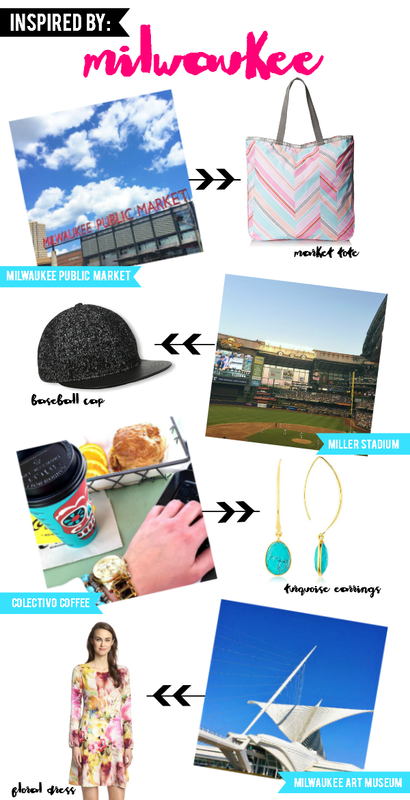 I thought I'd share a few MyHabit pieces inspired by my favorite spots around Milwaukee! 1. Milwaukee Public Market: Grab fresh flowers, cheese & wine here and you're all set for a picnic! This chevron Lesportsac Tote is perfect for carrying around all of your foodie finds. 2. Miller Stadium: Catch a Brewers game at this beloved Milwaukee stadium, be sure to get their early to tailgate! This tweed Genie by Eugenia Kim baseball cap adds a touch of chic to your gameday look. 3. Colectivo Coffee: This is without a doubt my favorite local coffee shop. Their branding is so fun & this pair of Turquoise Saachi earrings perfectly coordinates with my cheeky coffee cup. 4. Milwaukee Art Museum: The perfect spot to come to get inspired. Its location right on Lake Michigan is breathtaking and so is the architecture. This Sfizo watercolor floral dress would fit right in! MyHabit (if you aren't already familiar) is a fashion & home flash sale site. They have constantly rotating designer inventory for women, mens, kids & home at up to 60% off. If you love a good deal like I do you have to chek them out! They're a division of Amazon- so I love the ease of shipping & great customer service. I was dressed head to toe in pieces from MyHabit for the Brewers game. While some may think a dress is too much for a baseball game- do remember, I grew up in the South. I was super comfortable on the hot humid summer day. The ladies from the MyHabit PR team were so much fun and we had a total blast at the tailgate & game! I'll be sharing all of the details of my outfit for the baseball game on MyHabit's blog, "TheFIX" this week so be sure to stop by their site! The #ShopByCity fashion flash sale inspired by Milwaukee is still going until August 6th. Be sure to follow them on Instagram & Facebook to see what cities they're headed to next! 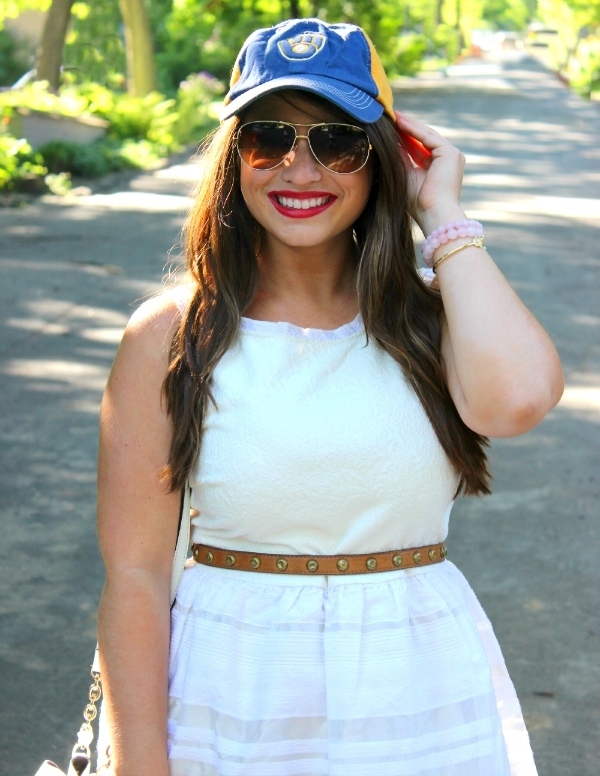 Disclosure: Thank you to MyHabit for sponsoring this post & my cute game day oufit!